Carry Your World by choosing vegan and cruelty-free. 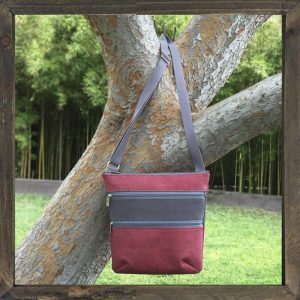 Shop ecologically conscious bags and accessories. Thank you for choosing cork. I used to shop at Coach for wallets and handbags but no more now that I have found Studio Auckland. 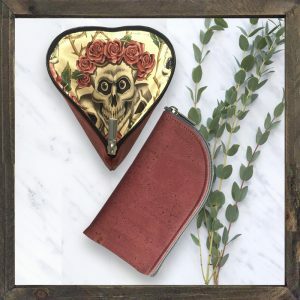 They hand-make the most beautiful and fashionable wallets, wristlets, purses, etc. I choose the color of cork, the style I like, the hardware, and the lining and they produce a stunning product. I have many of their pieces - each one is a work of art and highly treasured. Plus they are lightweight, functional and sturdy. The best gift you can give or receive. I have ordered three bags from Studio Auckland. Two were gifts (the Cabernet Two-Zip Wristlet and the Syrah Satchel Handbag). The third bag was a custom clutch made to match my dress for the Emmy red carpet. The bags, especially the cork, are great quality and durable for everyday use. They are lightweight, which is wonderful since most of us carry a lot of stuff in our bags. There are plenty of pockets and slots for all essential items. I love all the color combinations available. I wanted to let you know how happy I am with the cork wallet I purchased from Studio Auckland. I must say, I was not 100% sold that cork would hold up to my "wallet abuse," but I have been proven wrong! Even though it is overstuffed and overused, the wallet has held up beautifully! And I have been getting comments on it every time I take it out! Thanks again for turning me on to cork! You know how, when a relationship just isn't working and you have to do something about it, but you drag your feet? It may be guilt or a sadness that you're giving up on something in which you've invested so much time. Well, that was me and my old purse. We fought all the time and it got to the point where I had to say, "No more. Let's just call it what it is." Then I met my custom-designed Studio Auckland beauty! It gives me what I need: room enough to carry my world. I find I don't need to lug around an extra bag, anymore -- which is what I had been doing. I love the look of my new purse and the fact that I have the option of adding a long strap! It's so fantastic I don't give my old purse a second thought! Feels so good to love your purse, since we all know it is our best friend. Makes me happy to know that my wrist purse, eyeglass case, and business card holder are very politically correct and beautiful at the same time. Hard to believe that each of these items is designed and made completely by hand by my talented friend, Patty Andersen. Everyone will be talking when you tell them your purse is made from cork. Great conversation starter. I am the proud owner of a Studio Auckland cork purse. I get compliments galore. It is beautiful and made with such precision it’s incredible. I love it. Loved discovering Studio Auckland and its wonderful selection of unique and inspired gifts. Each one is obviously made with love! I’ll be back! Great Gift Items -- I was so delighted to see Studio Auckland products in "real life" at the Vegan Street Fair. I purchased items to be used as Mother's Day gifts for my daughter and two nieces. Kudos all around! The fabric is wonderful, the items are well made, the designs are great. We love all the offerings and can't wait to see what's next. Thank you, Patty, for making such lovely and useful items. Carol R., Los AngelesTraveler who uses a Studio Auckland pouch! My purse arrived today and I love it more in person than the website! Oh my gosh, the workmanship is breathtakingly perfect. what interesting things we carry around in our bags.